We found this tired old door at an auction house…. 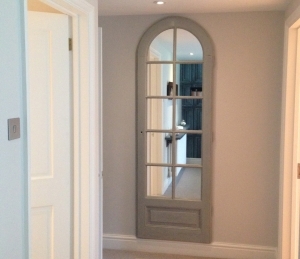 Once the door was stripped back, re-painted & glazed with mirror glass and hung on a wall it works beautifully as a grand ‘statement piece’ mirror. There are lots of old, odd doors & windows in auctions, most of them overlooked as they don’t fit with being re-used as they were intended, but if you find one that has an interesting shape try using mirror glass and make it into something special!